Iranian regime agents were arrested in the UAE after their plot to blow up the world’s tallest building was exposed. Palestinians, Syrians and Lebanese were among those arrested. The defense apparatus in the United Arab Emirates arrested 45 suspects, most of them Palestinian and Lebanese, after the plot to blow up Burj Dubai (Dubai Tower) was uncovered. 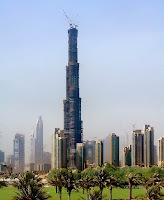 Dubai Tower, currently under construction, is the tallest building in the world. The current wave of arrests adds to the eight other suspects detained immediately after the plot was revealed one and a half months ago. The detainees were apparently sent as agents of Iran. Sadly, even if they did succeed in blowing up the Burj Tower, Obama would still want to sit down and talk with them.